I am not New Age anything, and I resent being called that. I am trying to open a door so that people can see themselves more clearly and perhaps be the light to get to God, whatever they may call that. I don't see spirits in the trees, and I don't sit in a room with crystals. Unfortunately for Oprah, this very denial revealed her New Age mentality. Notice that she refers to God as "whatever" a person "may call that." And she asserts that human beings can be "the light" to get to God. This denial is either a lie about her New Age beliefs, or else she is totally deceived by them. The essence of the New Age Movement is pantheism — the pagan belief that God is in everything and therefore everything is God.10 This belief stands in direct opposition to the biblical teaching that God exists separate and apart from His creation. A corollary of pantheism is the belief that Man is god and therefore the key to spiritual enlightenment and salvation is to recognize one's divinity and release it to achieve Christ-consciousness. On a program featuring a panel of New Age authors, Oprah said she does not think God is "hung up" on what we believe about Him. "Whatever that force is, it doesn't care what you call it. He doesn't have an ego problem." She went on to say, "I believe in the FORCE. I call it God. "12 On the contrary, the Bible reveals God as our Heavenly Father, as a person, and not as some impersonal force or "it." 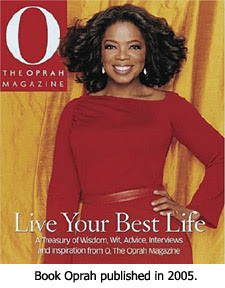 In her 2005 book, Live Your Best Life, Oprah described her theology as a belief that everything is one and Man is divine and Man can thus create his own reality. She encouraged people to meditate and pray (to any god!) and say, "My heart is open to find the flow, the flow, the flow, the flow that is my life...I am willing to surrender to the flow that is my life. "14 Does that sound like a Christian prayer to you? The Bible teaches that we are to surrender our lives to Jesus. As we continue in the next segment to probe into the extent of Oprah's New Age Church, we'll look at the menagerie of occultic guests she's had on her show. 7) Steve Rabey, "Oprah's 'gospel,'" The Christian Examiner Online, www.christianexaminer.com, page 1. 9) Watchman Fellowship, "The Gospel According to Oprah," www.wfial.org, page 2. 10) For an outstanding presentation of the fundamental beliefs of the New Age Movement, see Matt Slick's article, "What is the New Age Movement?" This is an article published by the Christian Apologetics and Research Ministry (CARM). It can be found at http://carm.org/new-age-what. 12) Watchman Fellowship, "The Gospel According to Oprah," page 2. 16) Watchman Fellowship, "The Gospel According to Oprah," page 3. 18) Wendy Kaminer, "Why We Love Gurus," Newsweek, October 20, 1997. Extremely rich with all the big cars, mansions, jets, pools, vactation mansions, lackeys, adoring public, etc. I wouldn't change places with them for anything!!!!! What does THAT say about being a Christian? It is interesting that the Lord gave me the same words about Oprah several years ago and I was cast out of the fellowship for saying she is one of the most dangerous women of influence of our time. God help her and her followers.